Tracking macros is guaranteed to provide the best results possible. It also allows you to have a more flexible food selection and eliminates food guilt. However, weighing your foods and tracking your macros everyday can be tiresome and time consuming, even when your diet is flexible – I get it. While there are obviously significant advantages to tracking your food intake, it definitely doesn’t have to be something that you do forever. I often get asked, “how long do I have to track my macros for?”. The answer to this is always “until it is no longer necessary to do so”. This might mean that you have reached your body composition goal, or you have almost reached your body composition goal and you have very clear understanding of the nutritional content of food and its effect on your body. Generally, if you have been tracking your food for an extended period of time, you almost become a walking MyFitnessPal and guesstimating food portions becomes second nature. You also have a good idea of whether you have consumed enough protein and fibre for the day. This all contributes to greater success in maintaining your weight when you stop “tracking” your macros. There is a method to all of this, and its called intuitive eating. Intuitive eating is a practice that is all about creating a healthy relationship with your food, mind, and body – where you ultimately become in tune with your own body. To eat intuitively, you may need to relearn how to trust your body. And to do that, you need to distinguish between physical and emotional hunger. Physical hunger: This biological urge tells you to refuel. It builds gradually and has different signals, such as a rumbling stomach, fatigue or irritability. The urge is satisfied when you eat any food. Emotional hunger: This is driven by an emotional need. Feelings of sadness, loneliness and boredom can create cravings for food (often calorie dense “treat foods”). Guilt and self-loathing often result from eating these foods. You allow your body tell to you when it’s hungry, what it would like to eat, and when it’s full. Eating intuitively is something that many dieters don’t picture themselves being able to do, usually due to a lack of trust in their self-control or awareness. Another significant advantage of intuitive eating is removing constant thoughts based around eating food and when your next meal is. You have tracked macros for a long time: Having enough experience tracking your macros is essential for success with intuitive eating. You should feel like you know how much food to eat to maintain your body weight, lose weight or gain weight. You should have a good understanding of the caloric intake of foods and whether you are satisfying micronutrient requiremensts. You don’t have a deadline: Prepping for a fitness competition or photoshoot is probably not going to be an ideal time to start your transition. You will be able to enjoy the process far more when there are no feelings of pressure. You have reached your goal: Feeling confident that you are progressing towards your body composition goal, or have reached your goal is another important factor. If you still have a long way to go on your health and fitness journey, it might e a good idea to stick with tracking for a little while longer. You have a good relationship with food: Eating intuitively is potentially unsuitable for someone suffering with eating disorders such as restrictive dieting, clean eating orthorexia or binge eating disorder. Your intuition in controlling your own diet is dictated by your relationship with food and mentality towards food. If these foundations are disrupted by a poor relationship with food you’ll essentially be setting yourself up for failure. The thought of the concept doesn’t scare you: You don’t need to rush into anything. If the thought of you ditching the scales throws you into a state of panic, then you might need to keep the training wheels on for a little while longer. Stop weighing lower caloric items: This includes foods like fruits and veggies as well as sauces and condiments. This is when your experience with tracking macros and familiarity with weighing foods will come in handy. Stop tracking carbs and fats: A great way to start making your transition is to only track calories and protein and be flexible with your carbs and fat. As we now know, calorie intake and protein consumption are the main drivers of changes in body composition. From here you can move to tracking calories only as you will be familiar with portion sizes of protein and whether you have consumed enough for the day. When you feel comfortable, you can then stop tracking calories too. Slowly add in more “untracked” meals: Start by not tracking one meal every day. It might be breakfast, lunch or dinner – whatever you feel comfortable with. Once you feel ok doing that, add in a second untracked meal. Repeat the process at your own rate until all of your meals are untracked. Don’t track on weekends: Weekends are often when self-control goes out the window. They can, however, also be a great place to start your transition. Only track your meals during the weekend and eat intuitively on the weekends. Once you feel comfortable with this, you can slowly reduce the amount of meals you track during the week. Eat out more: This can help you with feeling more ‘normal’ and get used to eating food that you haven’t prepared. Again, this is when your experience with guesstimating portions sizes will come in handy. You may even like to allocate a portion of your daily (or weekly) calorie budget to eating out to help with your transition. This will help with modifying your diet to be more flexible. Weigh yourself less: While it is still important to occasionally check in and ensure that you are still within your preferred range, weighing yourself less will stop you from overthinking your eating habits. Remember, daily weight fluctuations are completely normal and can be due to a whole host of reasons. Eating out more often and including a wider variety of foods that your body isn’t used to also has the potential to cause more fluid retention. While part of the process is being less concerned with your weighing and measuring yourself, it is still important to make sure you are moving in the right direction – just not as frequently as you may have been doing so in the past. So if you normally weighed yourself and took measurements and progress photos on a weekly basis, you might do it every fortnight for a while and then eventually once a month. Again, your transition will be at a pace that you feel comfortable with. If you’re putting on weight quite quickly or you are above the upper limit of the range you set for yourself, then perhaps you’re not ready for so much freedom and you may need to keep closer tabs on your intake. Alternatively, if you’re really happy with your progress and where you are sitting you can give yourself a little more freedom by perhaps tracking fewer meals, adding in more calories, and start to make the full transition to eating intuitively! While you can definitely still continue to lose fat while intuitively eating, most people will transition to this method as a way to maintain their body weight. If you do have a deadline or something come up that you need to lose a bit of body fat for, all you need to do is begin tracking your macros again and ensure that you are in a calorie deficit. Once the event is over, just shift straight back into intuitive eating! If you want to learn more about nutrition, flexible dieting and intuitive eating check out my Fit & Flexible eBook – The Complete Flexible Dieting System. 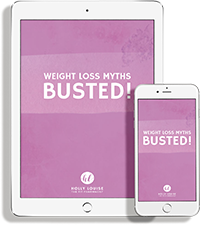 This contains everything you need to know about starting a flexible dieting approach and maintaining a balanced lifestyle while also achieving the results you want.